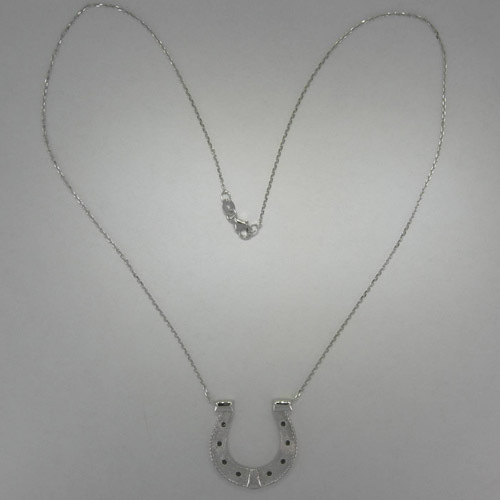 Desc: 14 karat white gold horse shoe necklace. The 14 karat white gold chain is a diamond cut cable link with a lobster claw clasp. 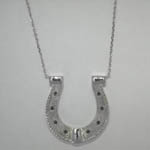 The 14 karat white gold horse shoe is textured along the center with a rope design along the outside edging. Holes along the center resemble nail holes of the horse shoe. The horse shoe has a toe guard and heel raisers. The necklace has a bright polish and textured finish. This necklace is made in the United States of America.